For the right dough it's worth having but the listed price aint it. 25 bags or a little less given the illuminati will be sweating like scousers in a math test? I kind of feel like you're missing the point. Maybe the previous group of 993 owners on here became obsessed with sell on values and originality but looking at the posts of most on here now they have bought these cars to drive not as investments. I've just invested around £20k inn my car because I love it and because I didn't want another modern car the £80ishK I paid for mine. All the usual irrational reasons apply - physical connection to the steered wheels, lack of traction control, manual gearbox etc etc. But even on a rational level, If I sold my car and got £90k for it next year I would still have had more fun and lost less money than if I'd bought a 991 or worse even a ghastly Jap or Italian pretender. Get your point but not sure how many forumers its relevant for anymore? E63 too fast for UK roads, 2-3 seconds of WOT and your in licence loss land. F355 too flimsy to use much and no space for kids! E63 too fast for UK roads, 2-3 seconds of WOT and you're facing jail time. F355 too flimsy to use much and no space for kids! Have to agree with Nick re the 993, it's a hard car to beat as an allrounder. I'm on my second 993 and had a mildly tweaked 996GT2 previous to air-cooled. As great as the GT2 was and an absolute weapon when required... it's just not as much fun as the 993 where you can exploit a lot more of the power a whole lot more of the time. I've had lots of M Cars and currently run a modern V8 daily too, great cars for wafting about in but if the weather is dry, it's the keys to one of my older cars I go for which generally leads to a fun or eventful drive out. Interesting this as I think you have the link many are overlooking. Like you, I wanted a 993 and preferably a wide body rear drive car (although I would have possibly taken a 4S or the right NB C2). When I say wanted one, I mean I wanted one above all else at any price point be it within or over budget. These cars are the last of the true breed, they are engaging, classy enough to take anywhere. They don't look overly flash so I never feel embarrassed if I parked it up in a client's car park, I can rock up to a classic car show, a track day, drive it across Europe. They are reliable, there is room for the dog and everything a couple of people might need on a road trip or holiday. I love the way it looks, I like that it is pure 90s cool, the noise it makes is perfection. I have read people say things like these cars wouldn't see which way a modern hot hatch went – not with me behind the wheel, it is still quick compared to modern sports cars despite its age. Some of the issue I understand from having a 964. You buy a car in the £teens and within a short space of time it is worth double. You know it is worth double yet somehow in the back of your head it isn't and you start to think you could swap it for something else. In my case it was a Spyder. The perception is these are better cars and there is some sort of trade up as these cars were always far more than £teens even though the selling/purchase prices are similar today. Then there is the hindsight thing going on where people can justify the spend on a 993 against the value increase. Not everyone who has pumped money back into a 993 has done it because they know the costs were covered by the price increases. I doubt many of us bought one as an actual investment, or were expecting free motoring. It is just the way things have played out that it almost seems like buying a car which may depreciate, or may cost thousands to maintain is insanity. It is actually the way it has always been with perhaps a few rare exceptions. I have a 160k miles 993 bought a little over two years ago. If I add up the purchase and everything spent from collection to date maybe pushing over £90k? Not finished either. £65k on a 3.8 C2 NB like at RPM? I'd of been all over that. Far more interesting (to me) than a car at £40k that is pretty much standard. If you want one you have to pay. People like Nick and myself prove the market is real. Either that or we are both utterly ***** mental. Well said! The Fezza is an investment ie it only goes up if I don't drive it! It lives in dry storage 400.miles from where I live. Its about as much fun as having a tooth pulled out! As Insaid before, put it into context with what you would lose on any new £90k car and it makes sense... but its not about that is it! The fixation on "doing its dough" or "whats it really worth" is irrelevant. The classic car market has stoppee going up so actual enthusiasts are focusing in on the cars they love and speculators/***** are driving up the nonsense that is the limited run new car market. Good luck with that! +1 spent 3 years looking for another air cooled after selling Carrera 3.2 and 964 C2 mainly because they'd become so valuable which wasn't expected. Looked for something more useable and settled on a 91,000 mile 993 C2 upgraded to RS spec by 9m for engine and the rest by Singer's UK agent (Heritage) - most fun car I've driven at sane speeds inc 720s, 458, 488 , 996/997/991 GT3, 991 Turbo S and 800 bhp 9e 997 turbo etc. The moderns are simply too quick if you want to avoid losing your license or worse. 200bhp/tonne is the sweet spot for an older generation sports car without all the modern traction control gubbins IMO. A healthy 993 on sticky tyres with an LSD on a twisty moorland road is hard to beat for fun, sh!ts & giggles. This sounds like a nice car although I dont understand why it needs a GT3 crankshaft and special rods given it's likely to be using the standard rev limit. Done well a rebuild with extra torque makes for a very different and even more satisfying drive. Crank may have seen better days, and if so why not put a GT3 one in? GT3 oil pump is apparently better too and fits with a little bit of machining. This was my car which rpm sold for me last year as I was building a house. The reason for the GT3 crank was that a GT3 crank has two oilways to the con rod bearings whereas the normal crank has just one. It was a blocked oil path that meant the previous bearing failed. Using a GT3 crank was thus an improvement in lubrication. The custom con rods were needed as there are no standard con rods to connect a GT3 crank to 993 pistons. As regards the mileage comments. The engine was fully rebuilt and so was the gearbox at around 118,000 miles and so the mileage of the mechanical parts is less than 20,000. The front seats were recovered in leather so internally, mechanically and externally it is little different to a low mileage car. As for how it drives, I took another 993 owner around brands hatch one day and he was amazed at the difference in how my car accelerated through the upper rev range compared to his. RPM built me a fantastic car, the mileage is immaterial, I’m sure anyone who drives it will love it. 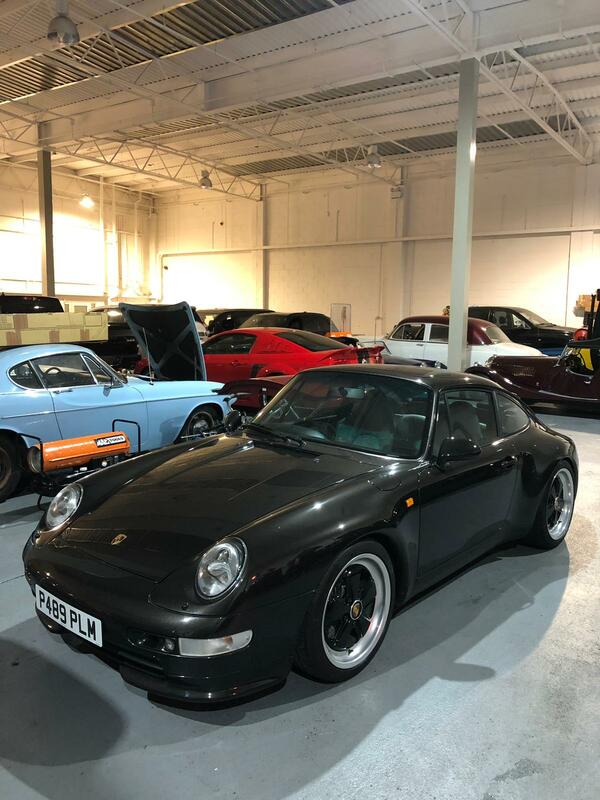 993 C2 Schwarz Black '96. GT3 Crankshaft, Mahle Motorsport 3.8 Cylinders and Pistons, BS Motorsports CAMS, 964 tappets. RSR Exhaust, Bilstein B12 Suspension. RS Engine Mounts, Porsche Short shift, Cup steering wheel, hollow spokes. Good to learn about the crank. Looks a cracking car. Hope you’re not missing it too much. This is a very well thought-out build, @786345jg . I’m the new owner and very grateful for finding her for sale at RPM. She is being loaded into a container and will set sail across the pond next week. Thanks for all the time and effort you’ve put into this car. All the work is highly appreciated, rest assure that she is going to a good home and will continue to be treasured for many years to come.